They were killed on June 3, 2005, at Forward Operating Base Orgun-E in Afghanistan when their convoy vehicle was struck by an improvised expolsive device. They were assigned to the 1st Battalion, 7th Special Forces Group, Fort Bragg, North Carolina. Sgt. 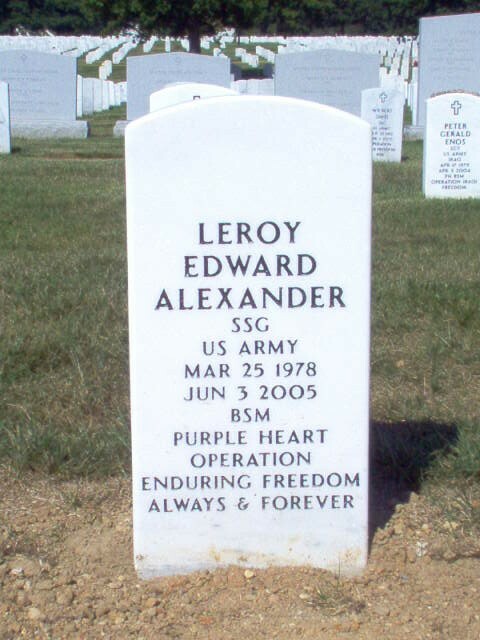 Leroy E. Alexander at Arlington National Cemetery in Virginia. The words bounced off the church walls as the crowd came to its feet, ready to send Roy Boy home. Later Monday afternoon, the mood changed, as Alexander was laid to rest at Arlington National Cemetery, two weeks after an improvised bomb killed him and another soldier as they were riding in a convoy in southeast Afghanistan on June 3, 2005. Alexander, 27, was born in North Carolina, but lived in Dale City as a teenager, where he met his future wife Marissa. He graduated from C.D. Hylton High School in 1997 and joined the Army, following his father Ronald, who served as a Marine in the Vietnam War. 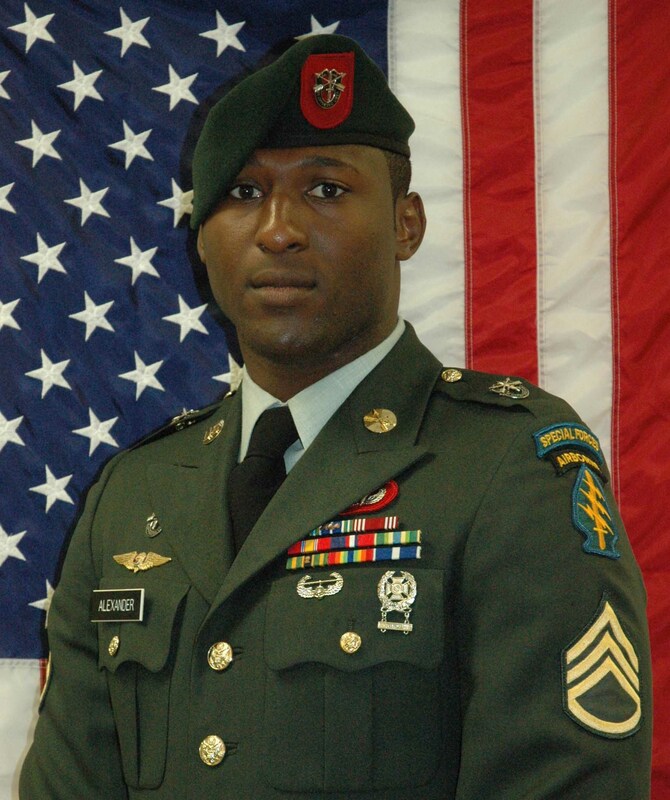 Alexander served in Kosovo and Haiti before his death in Afghanistan. He was scheduled to leave Afghanistan in nine days and then serve eight months in Colombia, before hopefully leaving the military to raise his family. His wife Marissa is pregnant with twins. Alexander enlisted as a technical engineer specialist, but later graduated from Special Forces Qualification Course and became a Special Forces engineer Sergeant. An estimated 500 friends and family attended Monday’s service, sharing stories about Alexander, who most people called Lee, except his grandfather, who called him Roy Boy. 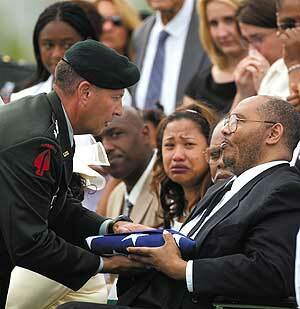 06/07/05 - The Grinkley family regrets the lost of your son. The Grinkley children went to school with him and is taking this situation hard. We know that God loves you and your family and we want to share that we care. 06/06/05 - Hearing of LeRoy's death has truly impacted me on so many levels. LeRoy was a good friend of mine throughout High School as well as a teammate in Hyltons Football Program. As long as I knew him he was an upstanding individual full of life and passion and it showed in everything he did. Knowing him and his family as well as his wife, I can only imagine the sense of loss and pain they are feeling knowing that a good person has been lost. It shows you that freedom certainly comes at a price. He will be missed and even though I have not spoken with him or his family in some time, my thoughts and prayers are with them in this time of need. He will truly be missed. 06/06/05 - I went to school with Leroy, we had Physical Education class together. I would like to send the family my heart felt condolencences. 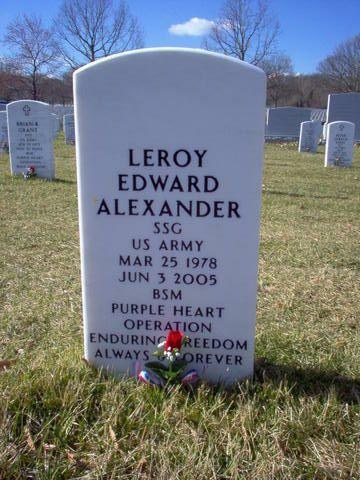 As a Marine myself, I will never forget, and will always feel indebted to Leroy for his service. Felicia Alexander remembered other stories from her son’s life, like when he begged her to let him play the trumpet and she could not afford it, or the first time he brought Marissa home to meet her. At the end of her tribute, Felicia Alexander presented Marissa with a flower arrangement, as her son liked to do. Elder Georgia Walker remembered running into Alexander at a restaurant in Fort Bragg, N.C., and him lifting her spirits, giving her the warm welcome she needed. Walker then saluted Alexander, as the crowd came to its feet applauding. Dustin Hanover, a friend from Fort Bragg, told a story of when Alexander and his wife followed them home from the hospital during a snowstorm to make sure they got home safely following the birth of Hanover’s first child. Hanover then said he plans to name his next child in honor of Alexander. 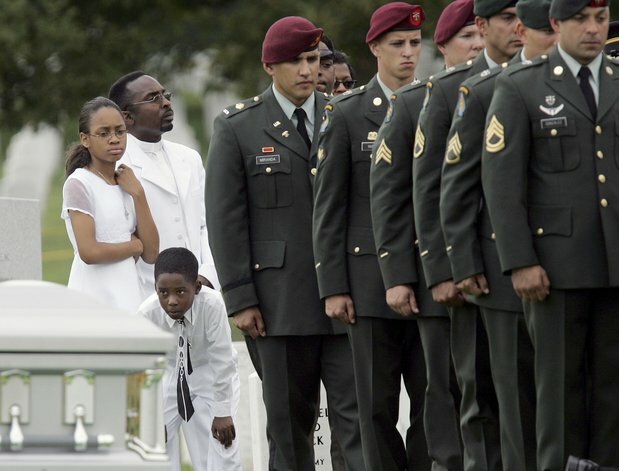 The service then moved to Arlington, where Alexander’s body was laid to rest. His wife and father were presented with flags as most of the crowd from the morning’s ceremony watched on. A bugler played Taps from across a field while a firing party fired three shots in his honor. Alexander was posthumously awarded the Bronze Star and the Purple Heart along with several other awards throughout his military career. Alexander is the 17th person killed in Operation Enduring Freedom buried at Arlington National Cemetery. He is the 10th soldier with ties to Prince William County to die in the conflicts in Afghanistan and Iraq.